We’re committed to creating an innovation ecosystem and fostering entrepreneurship in our research community. Our Innovation Summit and Innovation Prize are creating new opportunities to develop the translational and commercial potential of your breakthrough science. At CRUK, our mission is to beat cancer sooner. We’re driven by the need to see our research ultimately make a difference for patients and people affected by cancer. That’s why we’re currently working to ensure that academic researchers have the right support to be able to take their research on the next steps of the translational journey. In November, we gathered over 200 researchers for our first Innovation Summit. With a packed schedule of inspiring speakers, workshops, panel discussions and networking, the summit was a great way to exchange expertise and insight. 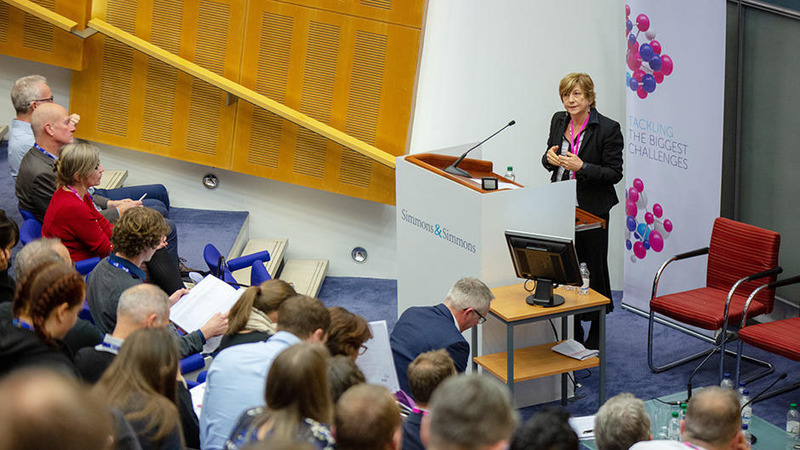 Researchers at all career stages had the opportunity to learn from some of the most successful academics who have become entrepreneurs, and from leading commercialisation specialists, how to navigate the many different routes for translation of basic science. The summit was opened by Professor Steve Jackson, Head of CRUK Laboratories at the Gurdon Institute, University of Cambridge. Steve’s research has identified many DNA repair proteins, established how they function, and showed how their dysfunction yields cancer and other age-related diseases. Alongside this bench work, Steve has founded or co-founded several spin-out biotech companies to translate his lab’s discoveries. One of these, KuDOS, generated the PARP inhibitor drug olaparib (Lynparza™) that is marketed worldwide by AstraZeneca for treating certain ovarian and breast cancers. In 2010, Steve founded Mission Therapeutics to exploit recent advances in protein ubiquitylation and deubiquitylation to derive new medicines. Steve’s academic laboratory is currently further defining mechanisms of DNA repair and associated processes, with a view to identifying new therapeutic opportunities for cancer as well as various other genetic diseases. During the Q&A session, Steve highlighted the valuable cross-talk between both aspects, academic and commercial, of his career, noting that they are mutually beneficial. He added that his team credibility combined with the vision and the passion to see the discovery in the clinic were key factors to win the investors. Jackie Hunter gave our second keynote, with an overview of her entrepreneurial journey so far, and her tips from the top of biotech. Jackie has held numerous senior leadership positions in the pharmaceutical, biotechnology and innovation industries, and is currently the CEO of Benevolent AI, a company that uses artificial intelligence to disrupt the drug discovery and development process. Are your constraints real or imaginary? Challenge both. Don’t choose ‘yes’ people. A good team has complementary skills and approaches and can have opposing opinions. Don’t overload an investor pitch with too much science. Discuss the team, anticipate the outcome, be clear on the financials. Ensure you understand valuation and financials. You may not become the CEO. Be resilient and prepared that your venture might fail. Failure is OK but learn from it. Choose your VC, advisors and development team carefully – this is vital, you need to have good rapport with them. ‘You must feel passionate about your project and what it will do for the end-user / patient’. VCs invest in people. In this panel session, Andy Richards (Biotechnology entrepreneur and business angel), Frederick Nicolle (Patent expert), Mark Pearson (Boehringer Ingelheim International), Rebecca Todd (Longwall ventures) and Alex Pemberton (Head of therapeutic Discovery Funding at CRUK), provided the audience with some top tips to embark on the journey from discovery to commercialisation and addressed the many questions from the audience. Be aware of your skills and build a good team around you, so you can deliver together. Be aware of the what, when and who. What - it is not just about the science as the plan often changes. When - be aware that there are phases and trends in science as with any industry, so you need to have good timing. Not everything is ready to be translated. There is always some element of luck. Who - a good team is invaluable. Venture capitals (VCs) do their due diligence so be honest. Understand where the money is coming from, from beginning to end –this will benefit your interactions with VCs, it is a partnership. Before pitching to a VC, make sure you find out about their operational strategy. This will help you to ensure the pitch is suitably tailored to each one. VCs look for creativity, entrepreneurial approach, a credible team and robust IP. Collaborations are an important way to accelerate the translation and development of the drug; be careful of what you reveal in the public domain before filing. Think about IP and licensing opportunities, what is the best commercialisation route for you? How do you decide what to invest in? VCs are looking for a team that will create a strong and independent, standalone company that will be able to raise further funds down the road. There should be capability within the team to flex but also options in the technology too as very few companies succeed with plan A.
VCs want to help create a culture and partnership where the entrepreneur will call the investor and confide in them. For this there needs to be transparency. There are more options now than in the past. Timing is critical; investors provide the time and space to allow entrepreneurs to get to the translational end-point, it is a partnership. How can we best support up and coming entrepreneurs? We need to provide people with the flexibility to allow people to shift their efforts over time, encourage more diverse teams (expertise, skills, disciplines, experience). Is now the right time for Digital and AI? There are many more investors moving into the digital health space, with pharma and other more traditional companies also moving into the sector. In addition, disruptors like Facebook and Google are continually improving access to data sets and evolving AI and machine learning technologies. These are all great steps forward, data has the potential to change the healthcare space, but there are issues/challenges to overcome. In this panel session, Professor John Lyon (Professor of practice at Warwick Business School, serial entrepreneur and business angel), Billy Boyle (co-founders of Owlstone), Jason Carroll (Group leader at CRUK Cambridge Institute and co-founder of Azeria Therapeutics) and Angela Russell (Professor of Medicinal Chemistry at the University of Oxford and co-founder of OxStem) addressed questions from the audience and provided some top tips to embark on the entrepreneurial journey in relation to forming a pin-out company. An initial failure can provide invaluable experience and will create the insight for starting up the next company. Starting up a company can have a negative influence on the lab output. Be prepared for some sacrifices – for instance publications may be delayed. Geoff and Anna combine their expertise in computational biology and single cell DNA sequencing to select targeted therapies for cancers of unmet need. With their combined experience in antibody plant manufacturing and oncology, Audrey and Laura are investigating the quality and efficiency of plant-produced antibody for cancer treatment. We're now planning regional events around the UK, and also working on new initiatives to promote entrepreneurship in our community. To be the first to hear about new events and opportunities, sign up for our Research Update email newsletter. We wish to thank Alison Howe for her support in enabling us to share these learnings from our first summit. It’s a long journey from a bright idea in the lab to a commercially viable product. We spoke to 3 researchers about how they navigated the route. As our Centre for Drug Development celebrates its 25th birthday, we look at how the landscape of drug development has evolved and the impact our unique work is making internationally. Where next for cancer immunotherapy? We're driving discovery research in immuno-oncology which is leading to new and exciting immunotherapeutic possibilities.